Tomorrow, Tuesday, November 6th is Election Day!!! Cordially Invites you to Network with your fellow members! Don't miss out on this excellent networking opportunity! Individual Tickets - $95.00 - ON SALE NOW! 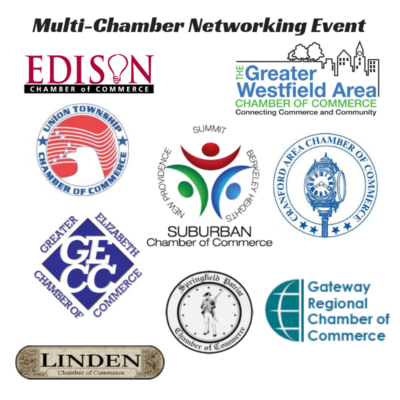 Join us to meet business professionals from the Greater Westfield Area, Cranford Area, Gateway Regional, Greater Elizabeth, Linden, Springfield, Suburban, Union Township chambers. Enjoy the delicious all-you-can-eat buffet and make valuable contacts. Bring plenty of business cards. General Admission: $40 Chamber Members. Sponsorship Tables are available for $225. Check out these year-end discounts from Cubical to Breakroom!! Make a difference this Thanksgiving by sponsoring one or more turkeys and trimmings to a deserving family! Boys & Girls Clubs of Union County is initiating a "Turkey & Trimmings Drive" to benefit Boys & Girls Clubs of Union County Families. Make a difference this Thanksgiving by sponsoring one or more turkeys and trimmings to a deserving family! Your donation will make a world of difference to a family living in need. Please help us make a warm, home cooked meal accessible for our most vulnerable families. Your donation of $25 will provide a turkey and trimmings for one of our members and their family. To donate one or more Turkeys & Trimmings to a family in need, please CLICK HERE! facials that are customized to the client's skin analysis. Katica B ody Contour is the first spa on the East Coast to open a Hypoxi S tudio. Hypoxi is a low-impact technology that is used to target stubborn fat and reduce the appearance of cellulite. Isabelle and her talented staff love meeting new clients and are always always striving to create a phenomenal transformation, refresh and rejuvenate the body. Let Pointe Grande Liquor help you celebrate with their Grand Opening Specials! *PRICES ARE SUBJECT TO CHANGE WHILE SUPPLIES LAST NOT RESPONSIBLE FOR TYPOGRAPHICAL ERRORS. At Taborda's Grill House our goal is to provide quality service, excellent food, personal and cordial attention to every individual and create a comfortable environment. We believe in making each visit a unique experience and totally enjoyable. We also have a large parking lot to which is a great venue to coordinate and celebrate all kinds of special occasions. Ask about our LUNCH & DINNER SPECIAL: From Tuesday to Friday for $9.99. Includes: main dish, soup of the day & can of soda or water. One of Council for Airport Opportunity's many employer partners is looking for qualified candidates! The employer is seeking over 100 Passenger Assistant Agents initially. Therefore, the employer's recruiters will be at the Council for Airport Opportunity every Thursday at the same time (10-1pm) for the next several weeks. Anyone who may be interested in this position may visit our Newark office at the 17 Academy Street (Suite 501) They can apply, be interviewed, and perhaps tentatively hired on-site (per criminal & drug screening) for this great entry-level position. Manage operations with passion, integrity and knowledge all while promoting the culture and values of United. Candidates must have an open schedule availability and be willing to work Nights, Weekends and Holidays as needed. All Candidates that are chosen must clear a Background Check, Fingerprinting and Drug Screen. Restore Ministries has about 15 openings for children and teens from Elizabeth! Join us Tonight to learn more about the services we provide our Youth. call Ximena 908-346-2242 or Linwood 908-400-3293. Questions? Contact Clem Sanguiliano, at KUSBDC, 908-737-4070. Flexible Scheduling at Your Place of Business! We are accepting registrations for these open enrollment classes for employees of New Jersey businesses and non-profit organizations (non-government). Click on the class below to register. To participate under grant-funding, you must be employed for at least 20 hours per week and have employer sign-off. Descriptions of Computer Class Content are Found Here. Descriptions of Soft Skills Class Content are Found Here. Contact Nancy Burke 908-527-7207 for onsite classes at your premises. Contact Denise Petrosky 908-965-2359 for on-campus classes. Josephine's Place is Celebrating 15 years! Special Thanks to UAL Council 5 and Newark Flight Operations for their presentation of (2) Round Trip Domestic Tickets! These tickets will be part of our silent auction at the Fall Celebration, November 8th at Mayfair Farms. Click here for our full November Calendar of Events! For more information and Registration call 908-994-5139. Join Us at the Snyder Academy! Want to donate to Bridgeway Rehabilitation, but can't participate on 11/17/18? Click Here. Have you used this GECC Member Benefit Opportunity?